One of the things I love about summer is the opportunity to have fresh produce. Growing up in Iowa has been synonymous with from field to table. Summers are awesome because I can hit the farmer’s market and grab a variety of fresh produce that the farmers picked that morning. It’s sure to have a longer shelf life than what I could get at the grocery store. Once winter hits, fresh produce isn’t quite the same. We buy what we need, but spend a lot more time being critical about how good (or not) it looks. Produce loses a good portion of life simply due to the amount of time lost in the transit and distribution. One of the reasons I’ve quit buying cucumbers and some types of lettuce is because it goes bad before I can use it. I’ve tried leaving it in the store packaging, open in the controlled produce drawer or cleaning and placing in a plastic storage bag, but it seems fruitless. Some fruits, some vegetables fail to last very long. That was before I discovered Rubbermaid FreshWorks. Designed with produce in mind, FreshWorks uses patented venting technology to keep produce fresher up to 80%* longer compared to store packaging. (*Based on strawberries in FreshWorks™ containers vs. store packaging. Results may vary depending upon produce and use.) The lid regulates the flow of oxygen and CO2 while the tray elevates the produce, helping create an environment that helps produce stay fresh. Now, I don’t feel the rush to use produce as I previously did. I can stock vegetables like green beans without the fear of slime. And can we talk about spinach for a minute? One of my favorite salads was Cranberry Feta Salad, but I stopped buying the spinach for the above mentioned “ick” reason. I simply couldn’t go through the container fast enough and usually ended up throwing half of it away. Now, I’m able to purchase a large package at Sam’s Club, use it once and transfer the remainder to my FreshWorks container. 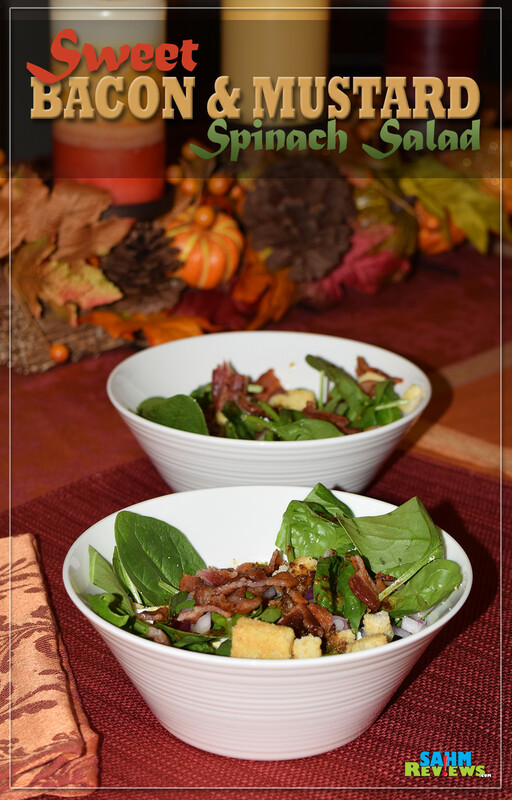 While we love the Cranberry Feta Spinach Salad, I’m also nostalgic for the Spinach Salad with Warm Bacon Dressing that I regularly ordered at a restaurant when we lived in California. With a combination of spinach greens and onions along with protein-packed eggs and feta, we don’t feel too guilty about the addition of bacon and a dressing made with bacon drippings instead of oil. Want to know how to make it? Here you go! Note: We regularly keep hard boiled eggs in our refrigerator for snacking. If you don’t, then prepare these first to ensure you aren’t waiting on eggs! In a skillet or other pan, cook bacon until crispy. Chop, dice and prepare all ingredients while the bacon is cooking. Set aside. The key to this salad is the warm dressing and how it helps meld the flavors together so it’s important that the bowls are ready and waiting when the dressing is done. 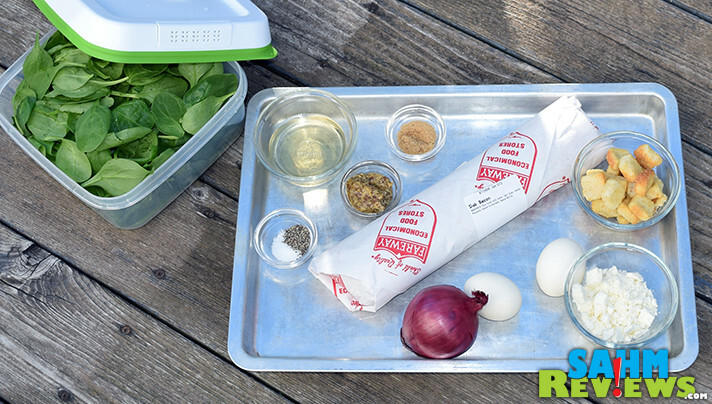 Combine 1 1/2 cups baby spinach, 1 Tbsp Feta cheese and 1/2 hard boiled egg in each serving bowl. Top each with 1 Tbsp croutons. Evenly divide the red onion among the 4 bowls. Once the bowls have been prepared, you can begin making the dressing. Reserve 4 Tbsp bacon drippings from the pan then discard the remainder. Return the reserved bacon drippings to the pan and turn to low. Add remaining ingredients (vinegar, mustard, brown sugar, salt and pepper) and stir until dissolved, adjusting temperature as needed. Remove from heat and immediately drizzle over salad mix. This will cause the spinach greens to wilt a little while also softening (and warming) the remaining ingredients. Crumble 1 piece of bacon on top of each, garnish with the second, serve warm and enjoy! While we previously would limit fresh produce purchases, with Rubbermaid FreshWorks we can feel confident in not needing to rush to use them. These containers are made in the USA and are BPA-free. With the addition of 3 new sizes, they can accommodate different vegetables and fruits so you shouldn’t have difficulty finding one that works for your needs. 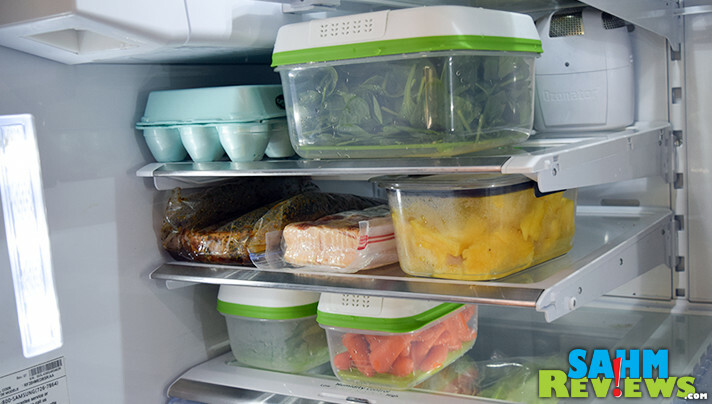 With my new FreshWorks, combined with my Rubbermaid Brilliance containers, I’m able to neatly and confidently store a variety of foods. As a bonus, they’re all dishwasher safe! Rubbermaid dominates my cabinet as well as my refrigerator. 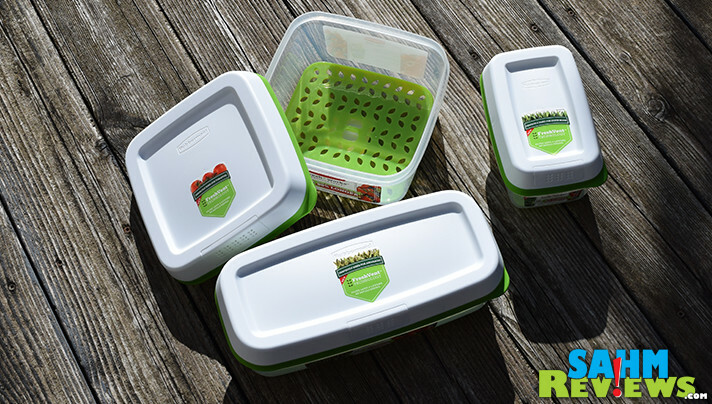 You can learn more about Rubbermaid FreshWorks containers on their website, Facebook, Twitter and Instagram. 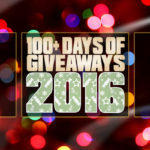 We’re pleased to be able to give away a couple pieces from their set. Enter using the form below. BERRIES- Raspberries, Blackberries, Blueberries, and Strawberries!!!! Yes, Michael! Raspberries and blueberries get gobbled up in the first sitting around here, but we buy strawberries from Sam’s Club that would go bad before the container was empty. Looking forward to putting them in the FreshWorks from here on out. Strawberries! And lettuces! These look great! And that salad looks delicious! my diced veggies like peppers, onions, and zucchini. Great idea, Shannon. I bet I would be more likely to snack on peppers and other veggies if they were already cut and prepared. I’ve been mostly using these for storage before I prep them! I haven’t been able to find the right “hold” time for avocados, but I haven’t bought them since getting these containers. I usually purchase them and eat the same day or the next. Do you buy them ripe or a little under then put them in the fridge? I am excited about storing my tomatoes in these containers! I would use them to store greens and berries along with other produce. I am most excited about using this for fresh greens/lettuce. I throw it out so often I stopped buying it. I’ll store my tomatoes and cukes! I love fresh apples and rhubarb. I will store strawberries and cherries. I would love to store my spinach, cherry tomatoes and onions in these. I’d love storing my berries! I would store lettuce in it. I want to store blueberries,peaches, and romaine in it. 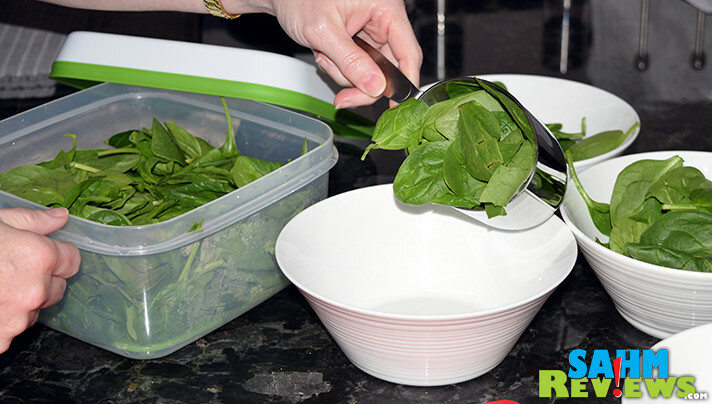 I’m most excited about storing spinach and other leafy greens in Rubbermaid FreshWorks containers. They always go bad in the store packaging before I can use it all! Strawberries! And lettuces! These look great! I eat a lot of salads, so it would be great for the lettuce. We also eat a lot of strawberries and they go bad sometimes before we can finish them. There are two things I’m really excited about using Fresh Works for, both Spinach & berries. And yest I have the same issue about not being able to eat it all and then it gets all slimy and yucky. Oh my goodness, that salad look amazing!! It would help with all produce, plus SO much more!!! I’ve never seen such a helpful giveaway!!! I am most excited about storing greens and berries. I want to store avacadoes since I can’t finish one in one day. This is going to be awesome for my spinach and other leafy greens, we go through a lot, but they never seem to last long enough. Sweet storage for all our veggies! I would like to use this for fresh berries. I would like these containers for spinach and broccoli. I could definitely use these for storing tomatoes, onions & red peppers! I’ll look forward to storing strawberries and mushrooms in FreshWorks containers. I would store my chopped celery, tomatoes and all sorts of fruit. I would storage my salad mixes in the containers. The salad bag does not stay fresh long. Spinach because it is the first thing to wilt and go bad in my refrigerator. i have to throw it out every time. Cut-up carrots and celery needs to stay crisp! I am looking forward to storing pineapple and raspberries! Storing lettuce is my #1 priority. I would be most excited about storing berries because they always go bad before I can eat all of them. This would be great for broccoli and strawberries! Lettuce and berries, they are so hard to keep fresh. All kinds of fruit and veggies! We would use these to store the apples we will be using to make apple pies! I would put in the container celery and carrots. Lettuce, strawberries, bell peppers, and grapes! I would use it for my celery. I’m low carb, so I eat an insane amount! I am excited about storing lettuce, kale, corn and cabbage. The salad looks really good!! 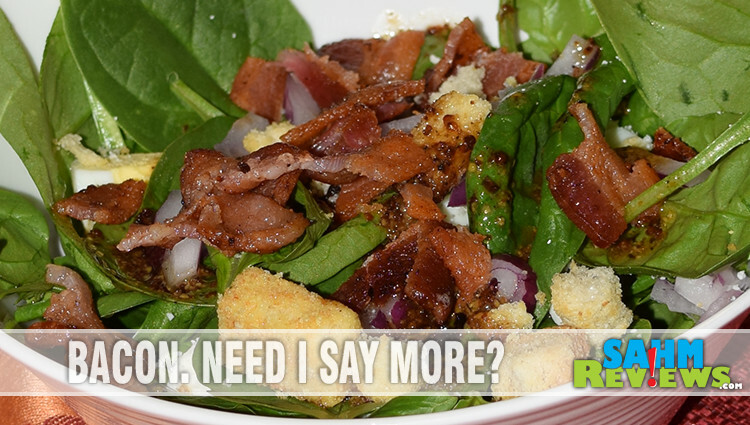 I’ve always like the flavor combo of spinach & bacon salad topped with a bacon & mustard vinaigrette dressing…YUM! 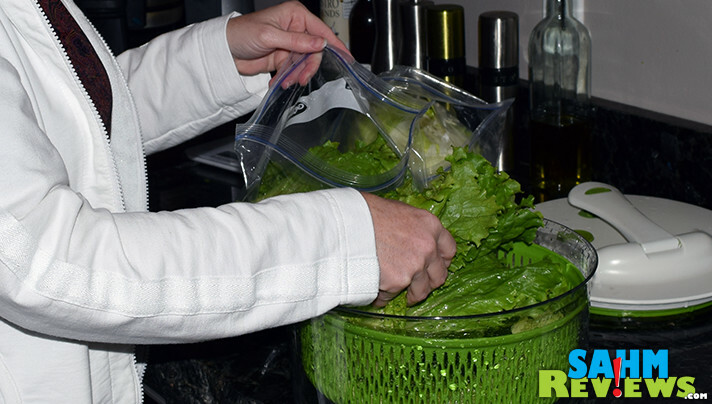 We are huge salad eaters so I would store lettuce in it to help prevent it from getting wilted. I try to prep as much as I can so that much is ready quickly. We also have a garden in which we grow quite a few veggies! This recepie looks really good!